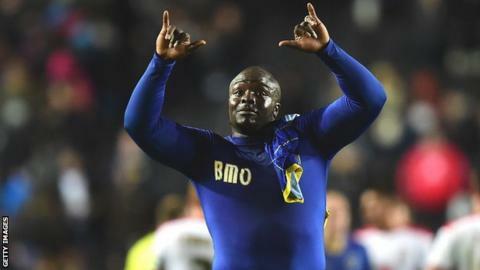 Adebayo Akinfenwa's quickfire double set AFC Wimbledon on their way to a thrilling win over high-flying Bury. The bulky striker, the matchwinner against MK Dons in midweek, volleyed in a 25th-minute opener and then headed a second from Sean Rigg's cross. Danny Mayor's fierce strike gave the visitors hope but Matt Tubbs poked in the home side's third to make it 3-1. Ryan Lowe's penalty, after Barry Fuller fouled Chris Hussey, set up a tense finale but Wimbledon held on. "After the joy of mid-week (beating MK Dons) this was the perfect game and we knew it was the perfect game but we knew we had to do a lot of work without the ball. "Credit to Bury. Throughout the game I never felt comfortable. I always thought they had a goal in them and credit to my players, they stayed with it and did everything right to see the game out. "We were against a team who have hardly lost a game this season, they were top of the league and are a very good passing team. "The first 20 minutes we got pulled about a bit, but once we got to grips with it we were excellent." "You get beaten in football if you don't do the right things and we didn't today. "We've had a lot of planning gone into the fixture. It's my job as a manager and coach to make sure that we are clinical. "For 30 minutes, the passion was good, the drive was good, the determination and our power looked good and we caused them quite a lot of problems first half. It's disappointing going in 2-0 down." Match ends, AFC Wimbledon 3, Bury 2. Second Half ends, AFC Wimbledon 3, Bury 2. Jack Smith (AFC Wimbledon) wins a free kick in the defensive half. Attempt missed. Danny Rose (Bury) right footed shot from outside the box is just a bit too high. Attempt blocked. Danny Mayor (Bury) left footed shot from outside the box is blocked. Corner, Bury. Conceded by Jack Smith. Substitution, AFC Wimbledon. Andy Frampton replaces Sammy Moore because of an injury. Corner, AFC Wimbledon. Conceded by Clive Platt. Adebayo Akinfenwa (AFC Wimbledon) wins a free kick in the defensive half. Sammy Moore (AFC Wimbledon) is shown the yellow card. Tom Beere (AFC Wimbledon) wins a free kick in the attacking half. Foul by Clive Platt (Bury). Tom Soares (Bury) is shown the yellow card. Dannie Bulman (AFC Wimbledon) wins a free kick in the defensive half. Attempt missed. Adebayo Akinfenwa (AFC Wimbledon) right footed shot from outside the box misses to the left. Attempt missed. Danny Mayor (Bury) right footed shot from the left side of the box is high and wide to the right. Substitution, AFC Wimbledon. Adebayo Azeez replaces Matt Tubbs. Jack Smith (AFC Wimbledon) wins a free kick in the attacking half. Attempt blocked. Chris Hussey (Bury) left footed shot from the centre of the box is blocked. Corner, Bury. Conceded by Sammy Moore. Attempt missed. Adebayo Akinfenwa (AFC Wimbledon) header from the centre of the box is just a bit too high. Substitution, Bury. Clive Platt replaces Nicky Adams. Goal! AFC Wimbledon 3, Bury 2. Ryan Lowe (Bury) converts the penalty with a right footed shot to the bottom right corner. Penalty Bury. Chris Hussey draws a foul in the penalty area.